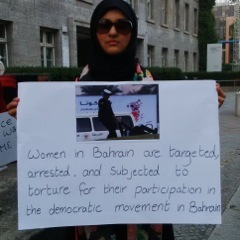 If Bahrain were a jigsaw puzzle, there would be many missing or broken pieces. The ruling family and its spin doctors are at pains to paint a picture of an island which holds up, and indeed upholds the sanctity of human rights. But that, say activists, is a blatant distortion of the truth. 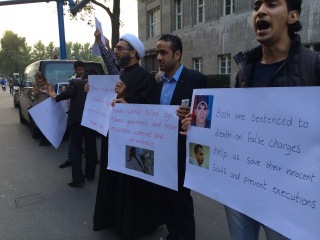 This week, the Bahrain PR train pulled into Berlin. It stopped at the central Maritim Hotel to let a "high-ranking delegation" of Bahrainis from business, education and culture circles disembark and take their seats at an event matter-of-factly called "This is Bahrain." The title begs questions, not least about the country's widely known and widely ignored human rights record. Had I been allowed to attend, I would have put those questions to the speakers. But it didn't come to that, as my repeated attempts to register in the name of journalistic research were met with a definitive, resounding "no". The official reason was oversubscription. Really? No matter, because in actual fact, the issue speaks for itself. Just as the Berlin event was getting underway, some 4,000 kilometres away on the tiny Gulf island, plain clothes police were serving the country's leading human rights activist Nabeel Rajab his latest arrest warrant. He had only been back in his native Bahrain for a matter of hours following a two month stint in Europe, when he was ordered to appear before the Criminal Investigation Directorate (CID) for having tweeted comments deemed defamatory and insulting towards the Interior Ministry. But the Bahrain Centre for Human Rights (BCHR) believes Rajab, who was released from prison in May having served two years for his role in the 2011 pro-democracy demonstrations, was really arrested for his most recent European advocacy efforts, which took him to countless foreign ministries across the continent, as well as the EU, the European Parliament and the United Nations Human Rights Council. At the time of writing, he remains in detention in a police station, where his family says he is being kept well away from other human rights defenders. The authorities have set his term in custody for seven days, but there are fears in the activist community that days could once again become years. 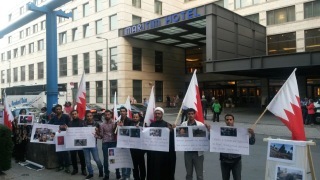 Back in Berlin, a small but determined group of protesters waving Bahraini flags set up outside the hotel. In reference to the king whose policies drove each and every one of them to seek asylum in Europe, they shouted "terrorist" and "dictator", and called on the German government to condemn the ruling family and its campaign of human rights abuse. 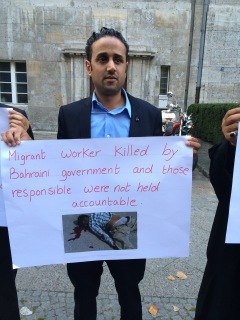 Activist Mohammed Aljazeri described the delegates at the "This is Bahrain" showcase as liars. 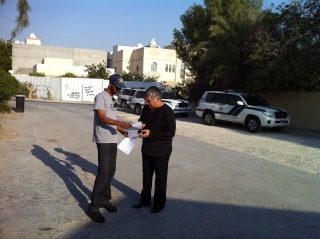 "They say there is freedom in Bahrain, but there is not," he said. "They kill children and arrest people who peacefully ask for their rights." Said Yousif Almuhafdah, Vice President of BCHR, who was also among the demonstrators referred to the pro-government delegates inside the Maritim as having come to mislead the people of Germany. But he urged them, and the international community at large, to see beyond the PR, and to look at uncomfortable images which leave no space for fabrication. "We are here to tell people there are grave human rights violations inside Bahrain, with people being killed and tortured," he explained. "There are 3,500 prisoners of conscience, discrimination against migrant workers, and women and children are being targeted." He, like other activists, says that contrary to popular perception, which is fuelled by the country's leadership, Bahrain is not intrinsically split down sectarian lines, and that Shia and Sunni have long lived in harmony. Moreover, he believes, they would continue to do so if the ruling family, which controls everything from the judiciary to the military to parliament, were to give the population the power, rights, equality and dignity it deserves.